The modern distillery manager is as much publicist as whisky-maker, traveling the world conducting tastings, visiting whisky fairs, entertaining distributors, and generally promoting his brand. Who hasn’t sat in rapt awe as Jim McEwan spun a tale of Bruichladdich, catching each eye in feigned recognition? Gifted storytellers these modern distillery managers are. Who has not heard Stuart Thomson wax on about the wonders that make Ardbeg, Ardbeg with little stops along the way to praise sister distilleries Glens morangie and moray, without wondering how the more taciturn Mickey Heads will fare as his replacement? But such was not always the case. In John McDougall’s time the distillery manager’s remit included increasing yields, recovering lost flavour profiles and searching out the little ingenuities that send angels’ shares home in workers’ lunch buckets. He did attend Vinexpo on behalf of Springbank, but other than that his work as a distillery manager was much more directed at making whisky. In his more than thirty-five years in whisky, which began at Aultmore in 1963 as a management trainee, McDougall met and worked with most of the characters and lived most of the situations that find their way into the modern promoter’s script, but perhaps because he was paid to make whisky rather than talk about it, McDougall has recorded these in a book that is at once rather amusing and quite informative. There are no rip-roaring belly laughs here (OK, maybe one or two), but chuckles abound and in the process the reader gets quite an unexpected insight into the whisky life. Stories abound of coppersmiths pounding copies of all the little dents and imperfections into replacement stills so not to affect the character of the spirit, but when Laphroaig expanded, it was decided to replace two stills with a single one twice the size, character be damned. So are the neighbouring old Glendullan and new Glendullan different distilleries as contiguous Glenlossie and Mannochmore are, and did the old Laphroaig distillery produce a different whisky than the new expanded Laphroaig? Anoraks can debate ad infinitum and they’ll find many other grey areas to question their precisions in a romp through Wort, Worms & Washbacks. 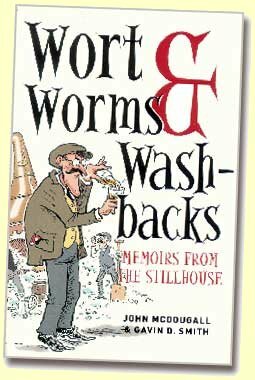 Wort, Worms & Washbacks is a series of anecdotes tracing one man’s career in the whisky business, and primarily in the production end of things. In his early career, McDougall worked for DCL, now Diageo, and moved among many of its distilleries doing stints at Aultmore, Knockdhu, Banff, Teaninich, Balmenach, Imperial, Dailuaine, and so on, before leaving DCL to become manager at Balvenie. He also worked at Ladyburn, Girvan, Laphroaig, Tormore and Springbank. That MacDougall knows his way around a distillery is clear and his insights provide a look behind the scenes at an industry that changed during his tenure and has been transformed since his retirement. Rare is the biography that lacks the soapbox, self-justification or congratulation, but in Wort, Worms & Washbacks the real article appears to shine through.